I had intended to post holiday pics in the order in which places were visited. But in the interests of keeping the military as opposed to architectural content on this blog reasonably regular I thought I would jump forward to South Carolina and the riches of Charleston's main historical museum. 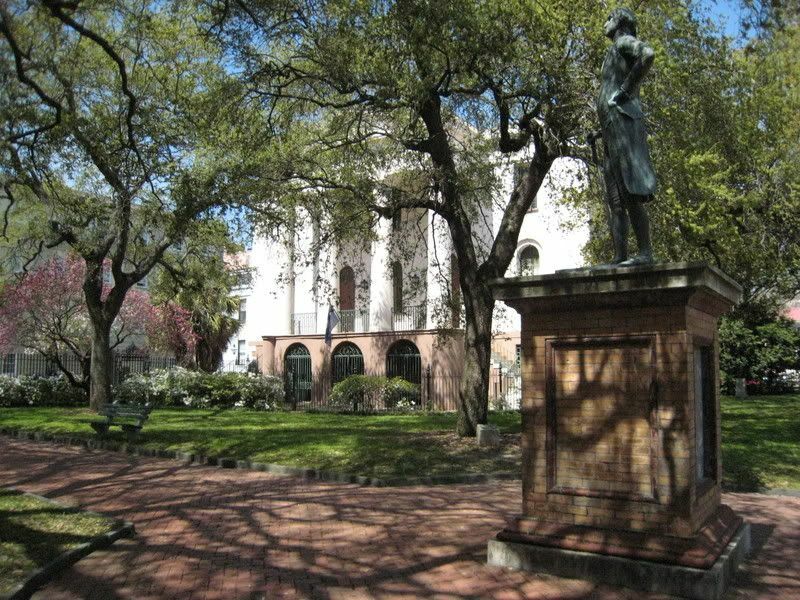 Charleston has several museums. The Confederate Army Museum was very interesting, although photos were not allowed. 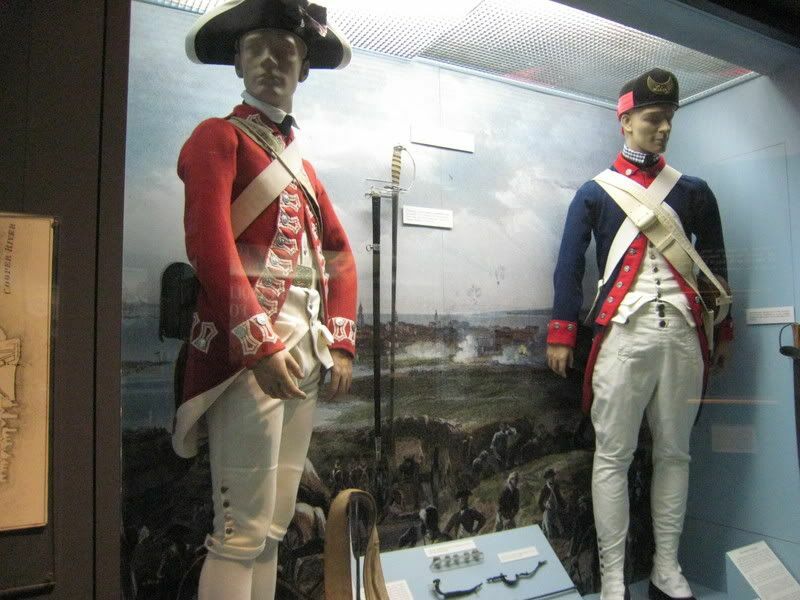 There was allegedly an Army Museum that contained several hundred uniforms from various periods, but I missed that one. 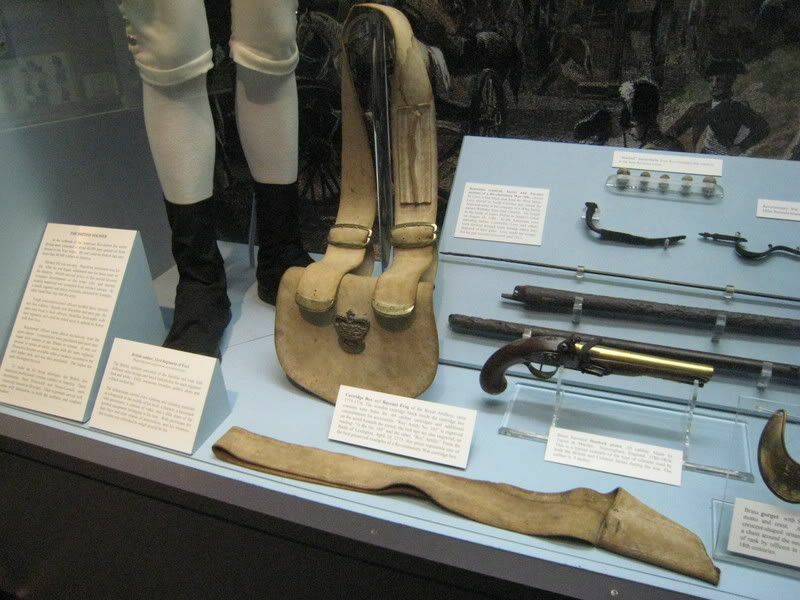 Never mind - The Charleston Museum, apparently the USA's oldest museum given that it was founded in 1773, contains plenty of military stuff. 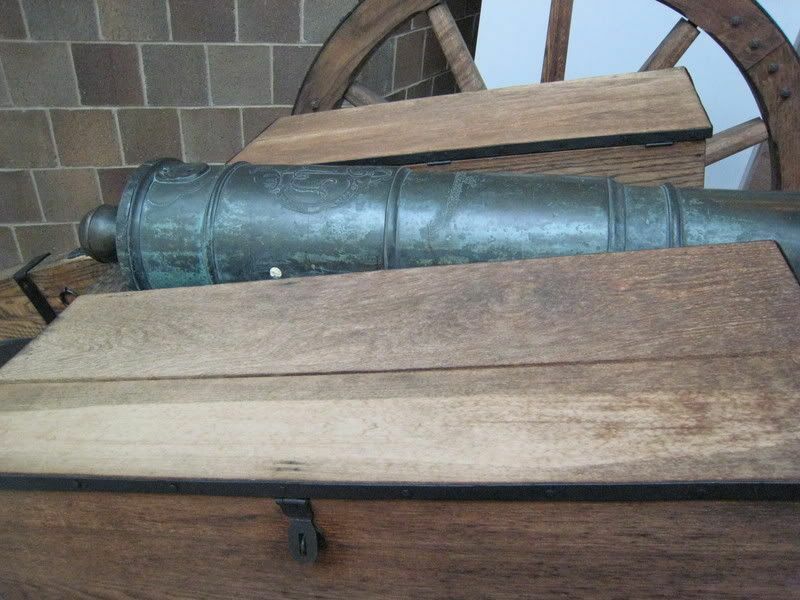 Of particular interest was an AWI Continental army 6-pounder. 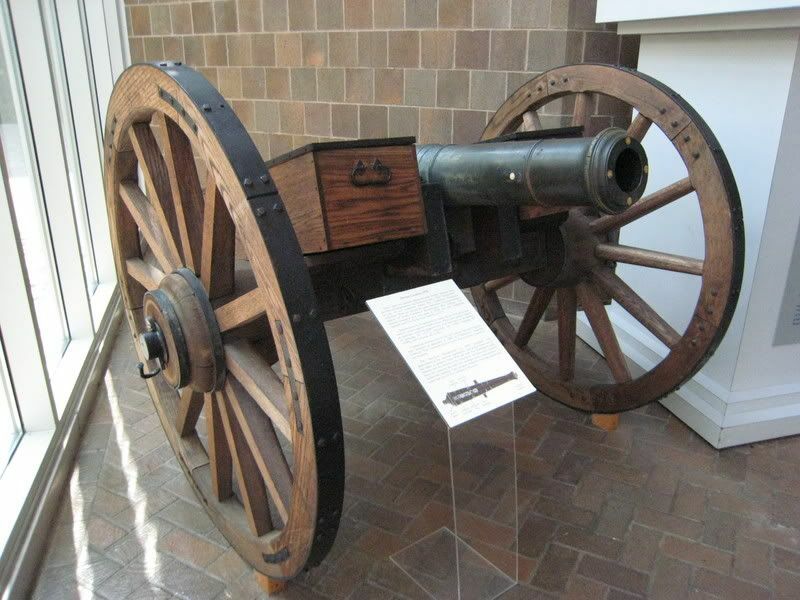 The caption explained that this is one of les than 10 extant American guns from the AWI period. The implication was that the entire gun dates to the period, but people I have shown these photos to suggest that the woodwork looks modern, or at the very least extremely well-preserved. 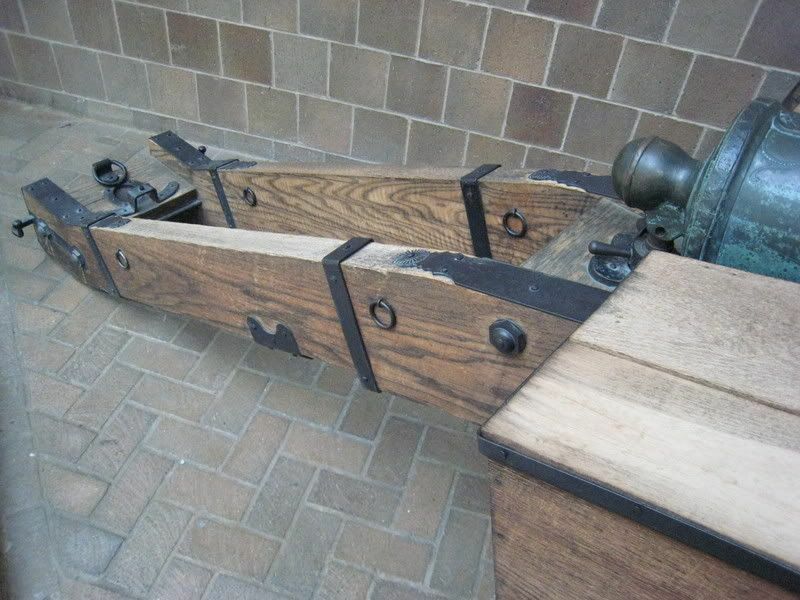 Even if the carriage has been restored, this gun would seem to answer the problem I had as to what the tops of the ammunition cases were amde of - wood or metal. Some readers probably knew all along; I had suspected wood, having for some reason thought metal for some years, but this confirms it. Even if the carriage is modern, the way the woodgrain looks is still useful for painting. 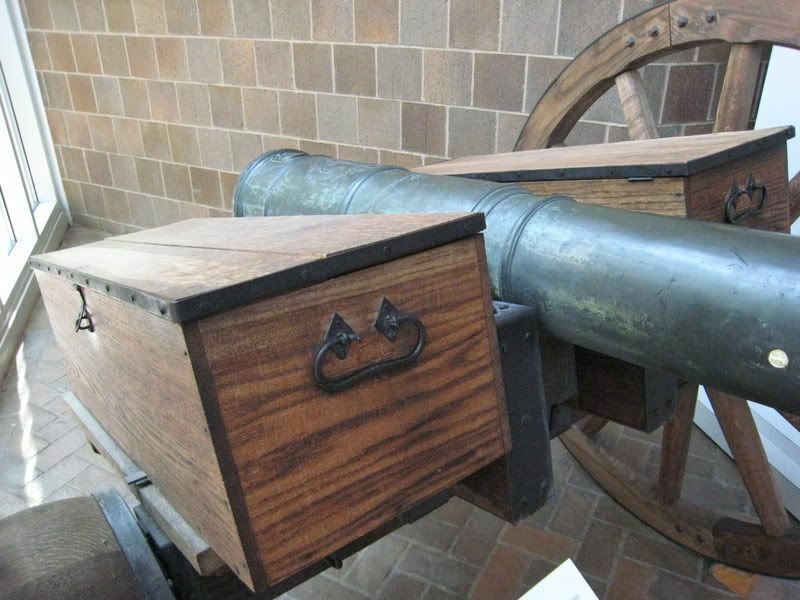 The museum has a second gun but it lacks the ammunition cases. Also shown below are some accoutrements from the AWI. The uniforms themselves (of the 33rd Foot and 1st South Carolina) are replicas but the individual items of equipment are authentic. I like the way the Royal Artillery cartridge pouch has (with age presumably) taken on a buff colour. I have been rather remiss at posting pictures from my recent American travels. 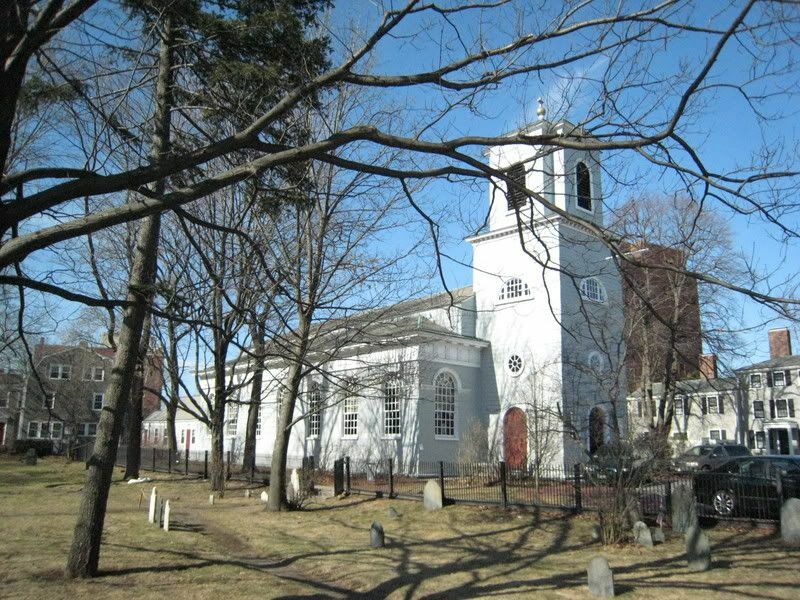 I appreciate that holiday snaps are not your average blog fodder, but readers may still be interested in a few more pictures of some examples of New England's finest colonial architecture. 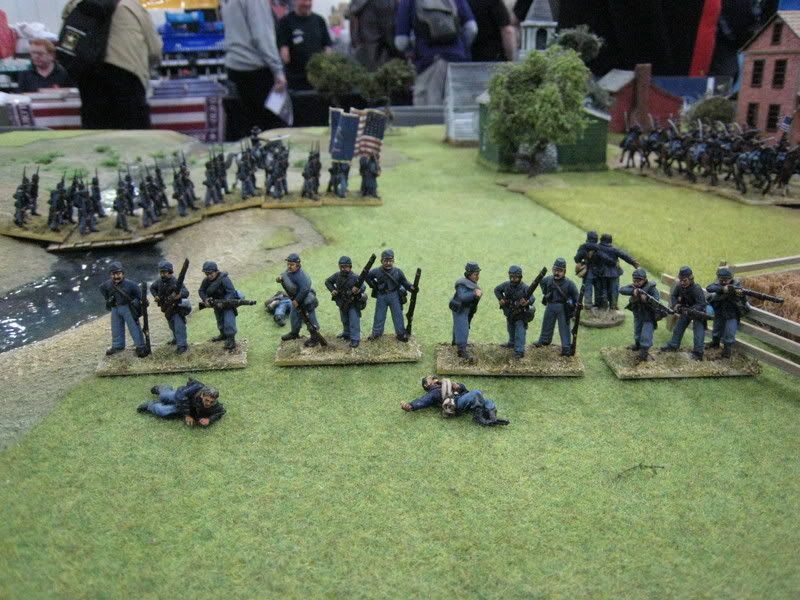 Furthermore, I do not as yet have any new units to post up, so it's either buildings or nothing for the next few days, I'm afraid (re the painting front: 84th Foot has 3 figures left to go; 8th Virginia has 11 and my first Reb ACW regiment has 5 - they will probably all be finished around the same time next week!). Whilst we were in Boston the Kiwi particularly wanted to spend a day in Cambridge, primarily to buy a Harvard University sweatshirt but also to see some of the university if we had time. It was there that I found one of the more modelicious (tm - the word means "begging to be modelled in 25mm") colonial-era buildings that we came across - Christ Church. 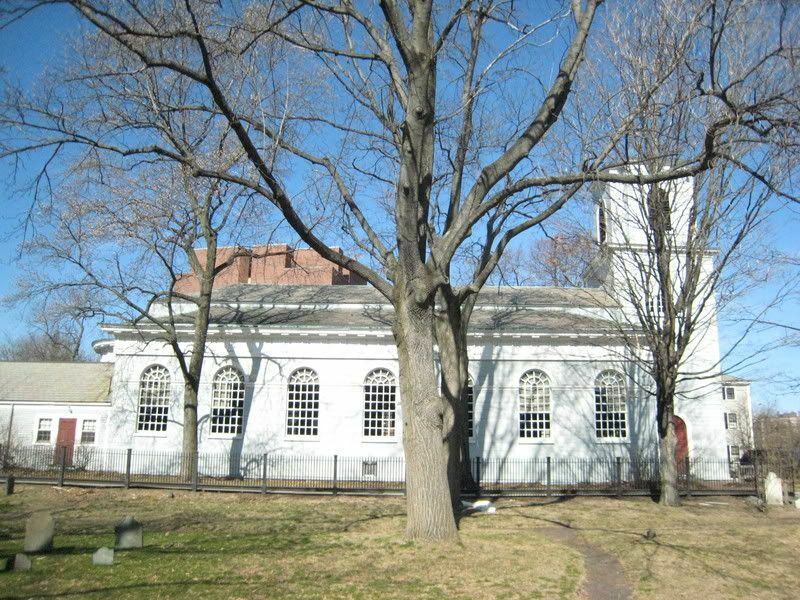 Christ Church was finished in 1761 and contains a pew in which George Washington and his wife Martha are said to have worshipped on New Year's Eve 1775. Apparently the church was vandalised in 1778 when word escaped that a British officer had been buried in it. 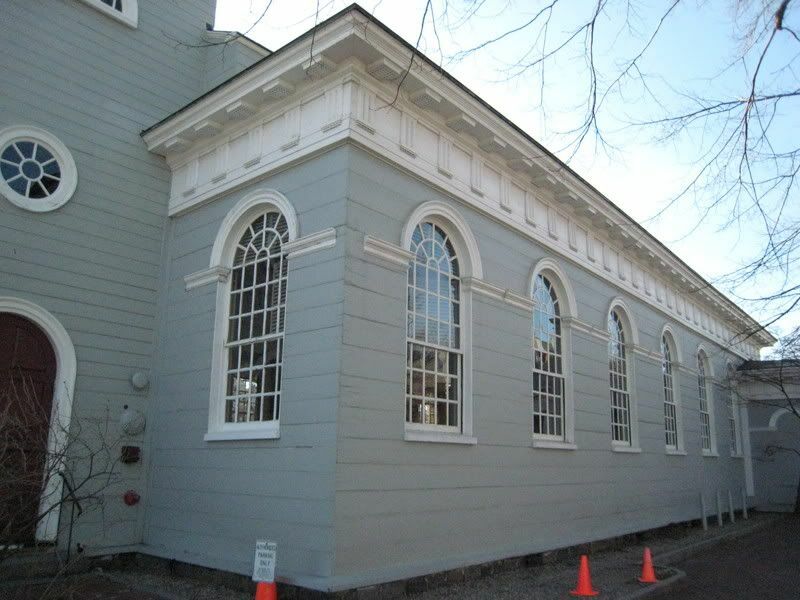 The buildings was enlarged in the 1820s and in revolutionary times would have had only 5 windows (or fewer) along each side. This building really would make a neat model and I showed these photos to the Tablescape chaps at Salute, who were suitably enthusiastic. Salute never disappoints. Well, it does if there's no trader selling GMB flags; but that minor annoyance aside I thought this was a splendid show. My own feeling was that the standard of demo/participation games was better than last year (I know others disagree) and the space seemed better managed and layed out. There were more children and families, which is always encouraging, and the trade stands were busy. 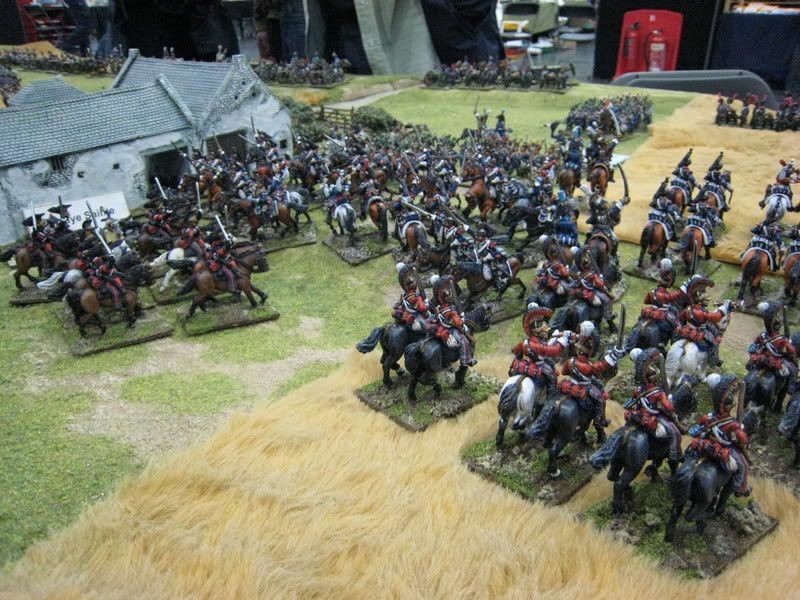 ACW was very much flavour of the day, with (I think) 4 games in varying scales, including the Perries' own 25mm demo, and some re-enactors from both sides of the war. Other re-enactors included imperial Romans, Vietnam GIs, Napoleonic Polish lancers and some Necromongers from "The Chronicles of Riddick" (actually, on reflection I think the last group may have just been wearing their everyday clothes...). The number of traders and games, many of which I never managed to look at, reinforced my view that this should be a 2-day event, or at least one with longer opening hours. There simply was not enough time to see everything and the photos below are a reflection of those games that I managed to find; there were plenty of others which I have heard great things about which I never came across. I was more restrained with my shopping that I had thought, at least where impulse buys were concerned. I binged on Perry AWI from Dave Thomas, who also supplied some useful half-price Foundry blisters. Foundry themselves had various "bargain" packs for sale, but they were very hard to identify (Crimean War and orcs mostly, I think). Irritatingly their paints were only available in sets and not singly - I thought they might at least have managed to allow painters to pick up the odd colours they needed; Foundry's loss was quickly Coat D'Arms' gain. Perry plastic ACW was flying off the shelves at Dave Thomas and from the Perries' own stand. 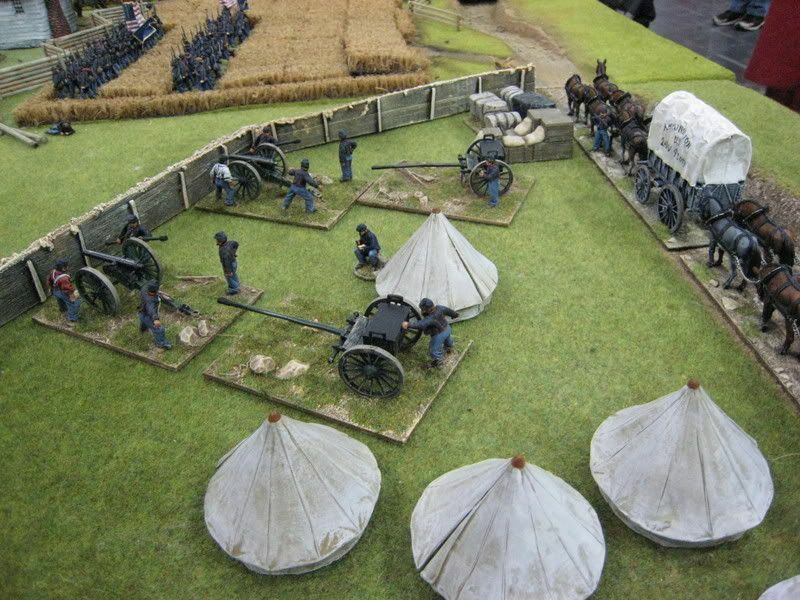 Alan told me that the ACW infantry had pretty much already recouped its tooling costs, which suggests that I'm the only wargamer who hasn't bought a set yet; given the clear success of the ACW figures I expect their next plastic plans are already underway. I bought the latest issues of "Wargames Soldiers and Strategy" from Caliver, some ACW from Dixon and one or two other things. I resisted the urge to increase my collection of TSS terrain tiles, mainly because I haven't yet worked out where to store the ones I already have. I meant to buy lots more farmyard animals from Amazon Miniatures but ran out of time. Socially the show was good and I caught up with a few mates. Those excellent chaps at Tablescape had brought along my model of the Benjamin Ring house (Washington's headquarters at Brandywine) - not quite finished yet but I got the gist of it and it's a pretty impressive model. I showed Chris some of the photos from my Boston/Charleston holiday and tweaked his interest in a couple of things. I took away his plans of the next commission, a farm complex, which I need to consider and finalise. A church and meeting house after that I think. Below are various photos. 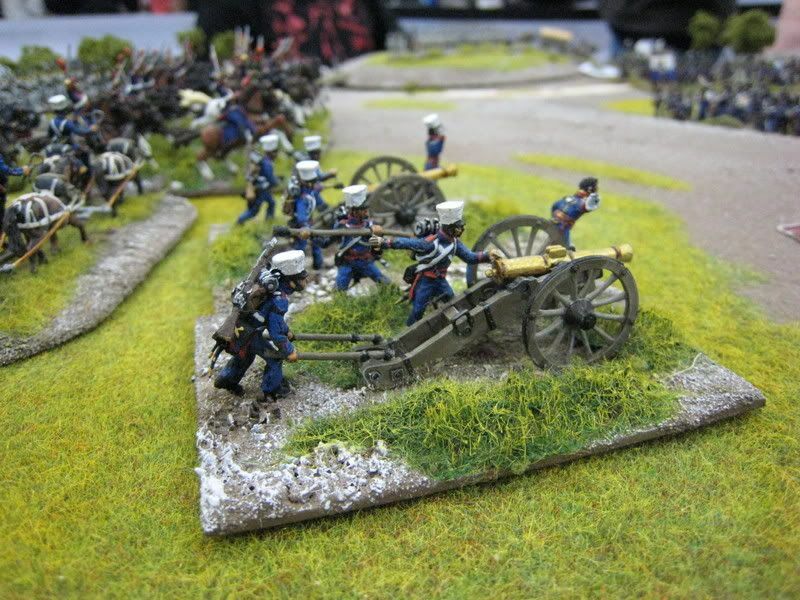 Loughton Strike Force presented their second 25mm Waterloo game. 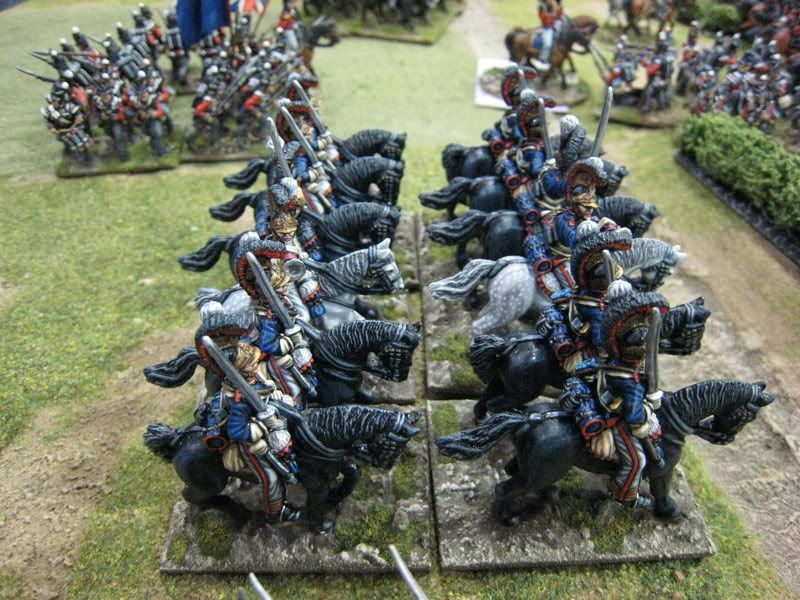 After last year's "Ney's Cavalry Charges" this game centered on La Haye Sainte. 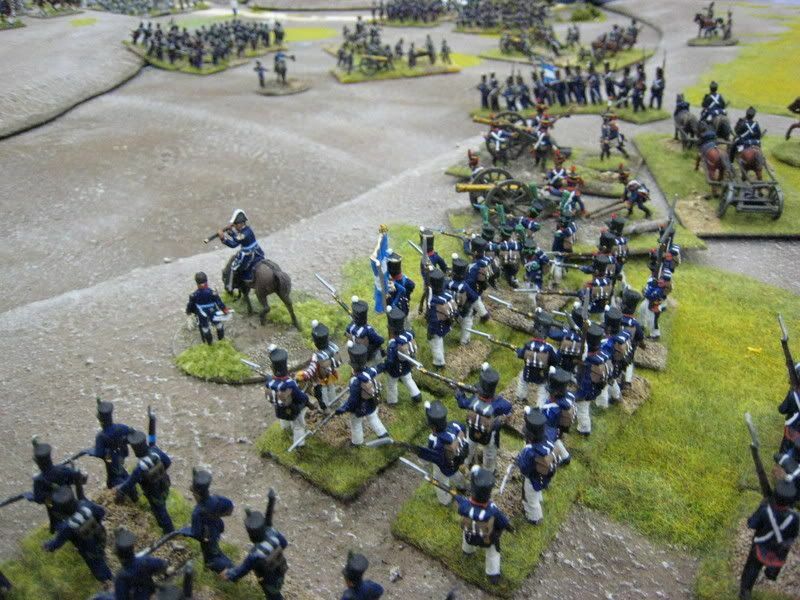 The Warlords put on a General de Brigade game set in the South American wars of liberation, "Maipo 1818". 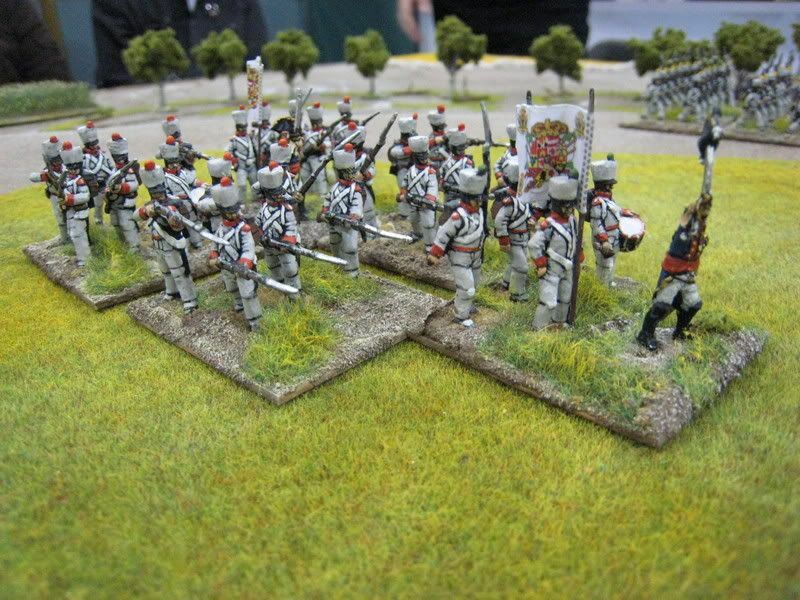 This game featured 20mm plastics, largely converted from Napoleonic figures. It looked stunnign and seems an interesting period. 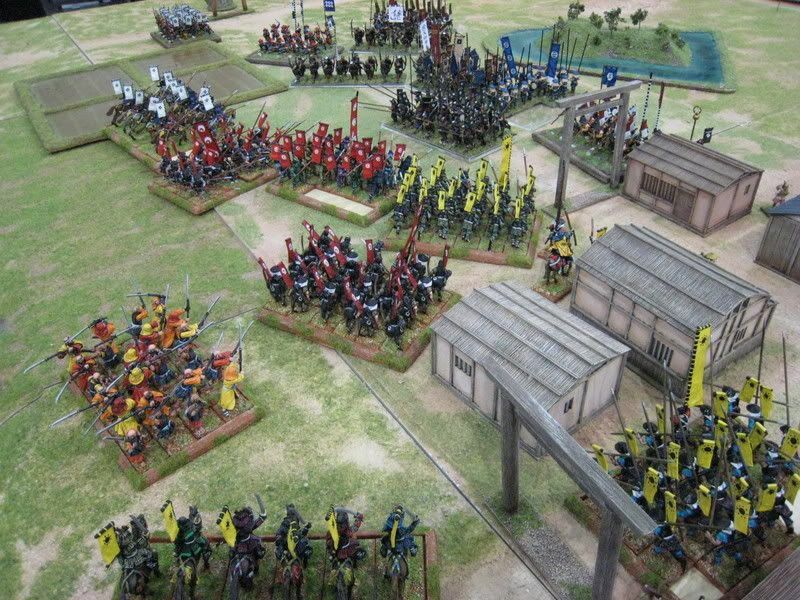 At the top of the post are: The Lance and Longbow Society's "Battle of Varna 1444" and Touching History's Peninsular game. 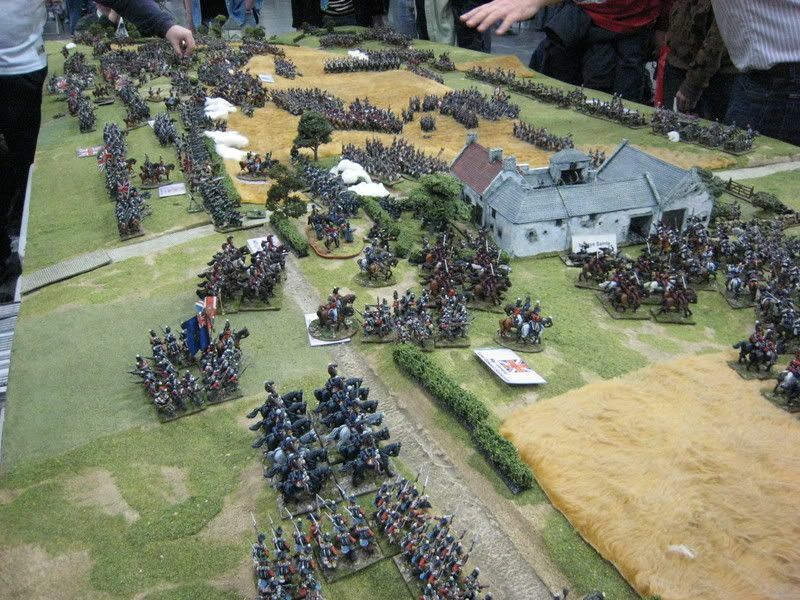 Below are: Loughton's Waterloo; Maipo 1818; perry ACW; the Shogun Group's "Domjogi" and finally the AWI game, using "British Grenadier" rules, of a hypothetical "Battle of the Clouds" battle, by GLC Games Club. As always, many thanks to the South London Warlords for presenting such an excellent show. As its numbering suggests, the 62nd Foot was a relatively new regiment, raised in 1756 as the second battalion of the 4th Foot. It was re-designated the 62nd Foot only 2 years later, by which time the regiment was in Canada and it took part in Wolfe's epic attack on Quebec the following year. After a period at home the regiment returned to Canada in May 1776 and joined Burgoyne's Saratoga expedition of the following year, during which it was brigaded with the 20th and 21st regiments under Brigadier General James Hamilton. 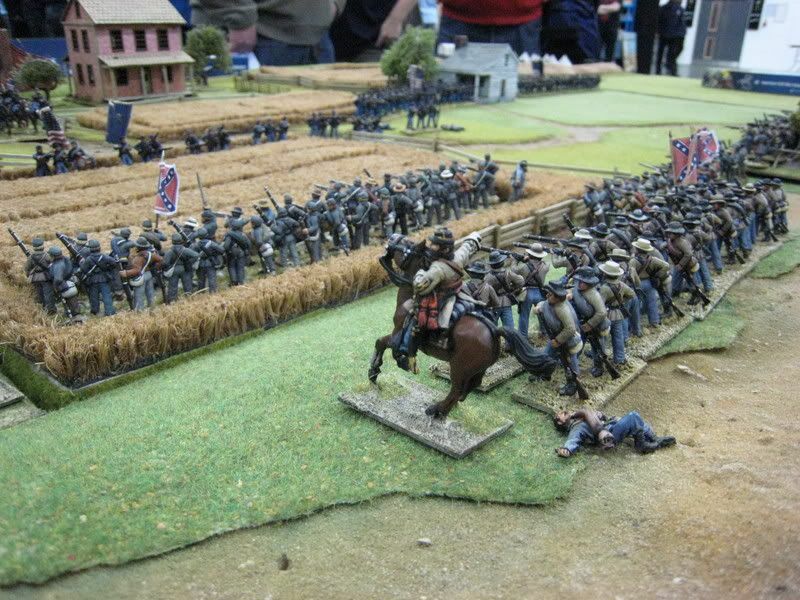 The regiment fought at both Freeman's Farm and Bemis Heights. 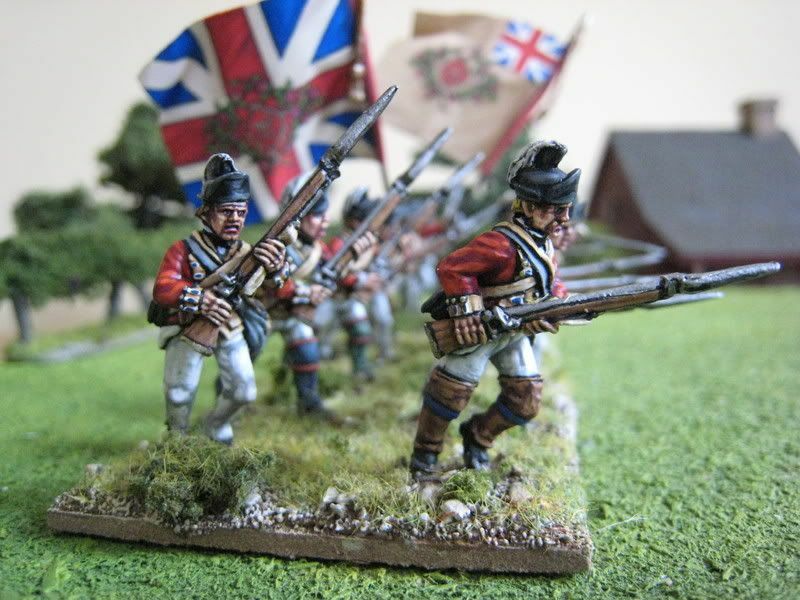 This is my fourth Saratoga British regiment and after two battalions in "firing line" poses and a third in "march attack" I decided to use "charging" figures. 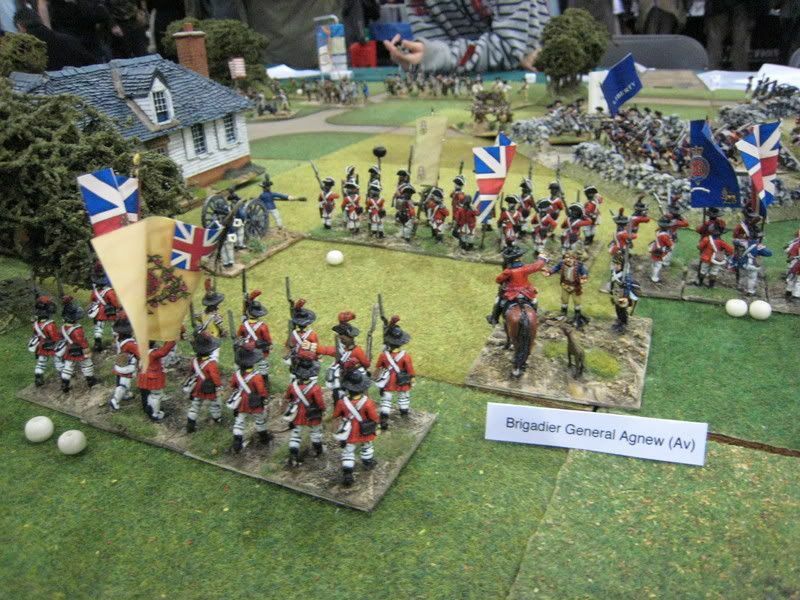 16 figures are required for the regiment in the "British Grenadier!" 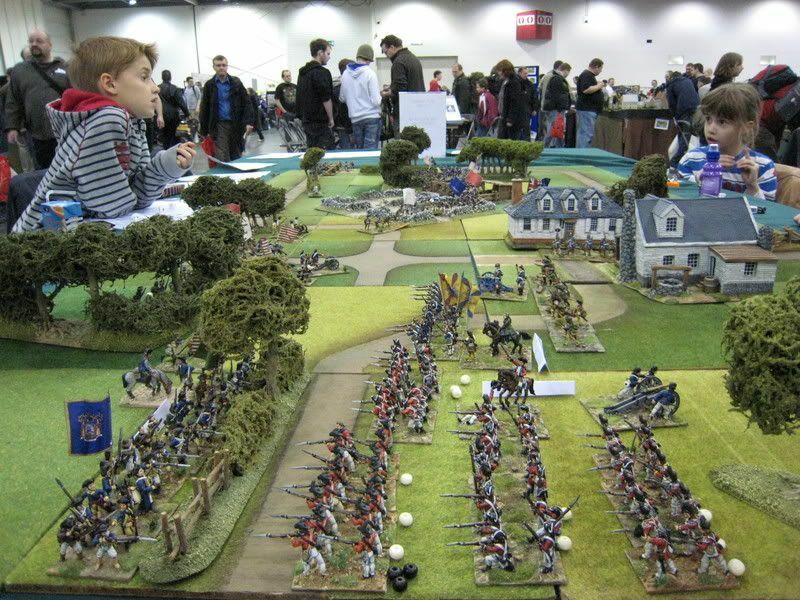 Freeman's Farm scenario (contained in the rulebook). As you can see, the unit's facings are buff. To add some more colour to the unit I gave the officer a patterned Indian bag. 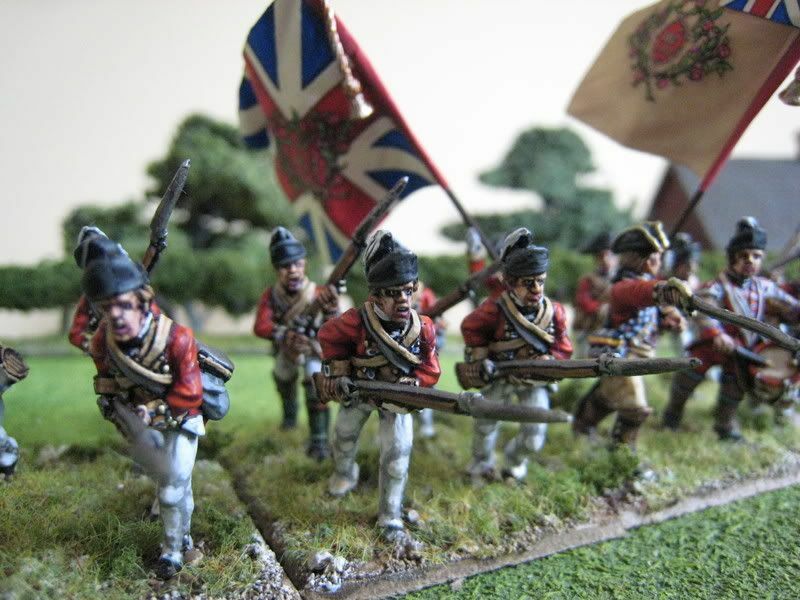 I painted most of these figures in February and finished them off in March I only made up the flags at the weekend and nver thought this regiment would take so long to reach the blog! 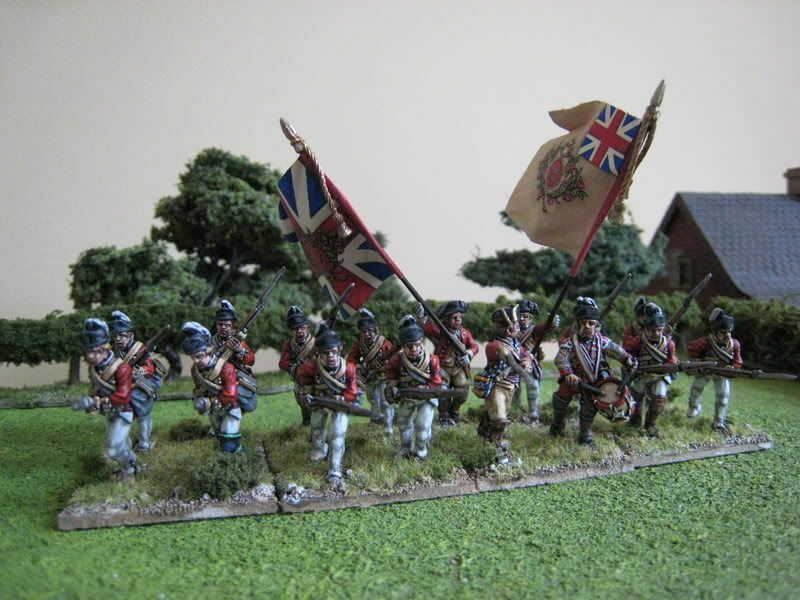 I have one Saratoga regiment left to go now, the 9th Foot (which, incidentally, are the only figures I bought at Salute last year which I have not painted). What's on the painting desk? 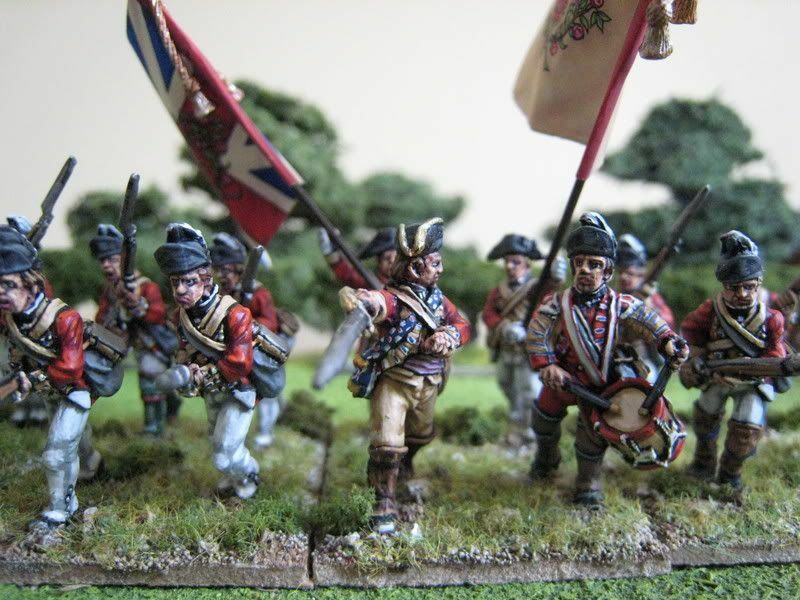 A few figures of the 84th Foot to finish off and I am also working on two units of Continental/militia regiments using a mix of Perry hunting shirt figures and the new militia. These should be finished fairly quickly after Salute, together with my first ACW Reb regiment. 16 figures. Painted February/March 2008. Flags by GMB. I found Boston a rather odd place. It was very quiet, perhaps because we were there over the Easter weekend and many places seemed to be closed as a result. Finding a drink was hard work (and I'm talking about in the late afternoon onwards here, not at breakfast time or anything); I put that down to the city's puritan origins, but I was told that it was more due to the area of town in which we were staying, the Back Bay (which at the time of the AWI really was a bay). Those bars that were open seemed to be obsessed with basketball, which is a game I have never understood - where's the fun/skill in it being played by people of over 6.5 feet in height, who seem to just stroll up to the net and drop the ball in it? Having players of 5 feet and under would make it far more entertaining. I liked the cheerleaders though; demo games at wargames conventions could usefully benefit by having some. But Boston was a fine place. It has some wonderful sights and Paris-grade shopping. In its restaurants we discovered the American habit of presenting you with your bill (or "check") as soon as you finish eating, which is much appreciated; in the UK you can often ask for it at least 3 times before it is finally brought to you, at close to 11pm. Boston has plenty of world-class restaurants and a major feature of our holiday generally was drinking good American wines (which are very hard to find in the UK); so for those who are interested in such things, wine highlights were: Terra Valentine 2004 Cabernet, Spring Mountain District (Napa); Duckhorn Wines' "Paraduxx" Meritage 2005 (Napa); Silver Oak Cabernet 2003 (Sonoma) and Stag's Leap "Artemis" Cabernet 2005 (Napa). Photos: above are (1) the Old State House, built in 1713 and the seat of colonial government until the AWI. 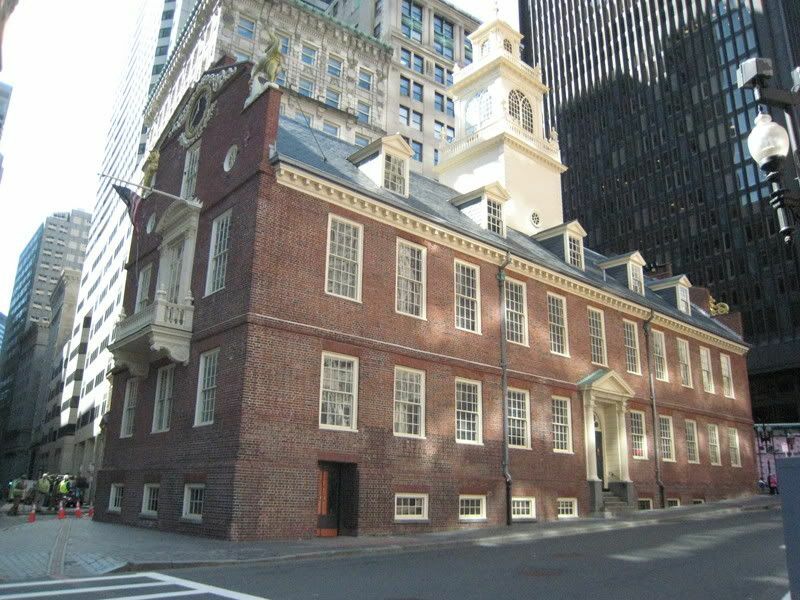 The Boston Massacre of 5 March 1770 took place just to the left of the photo. 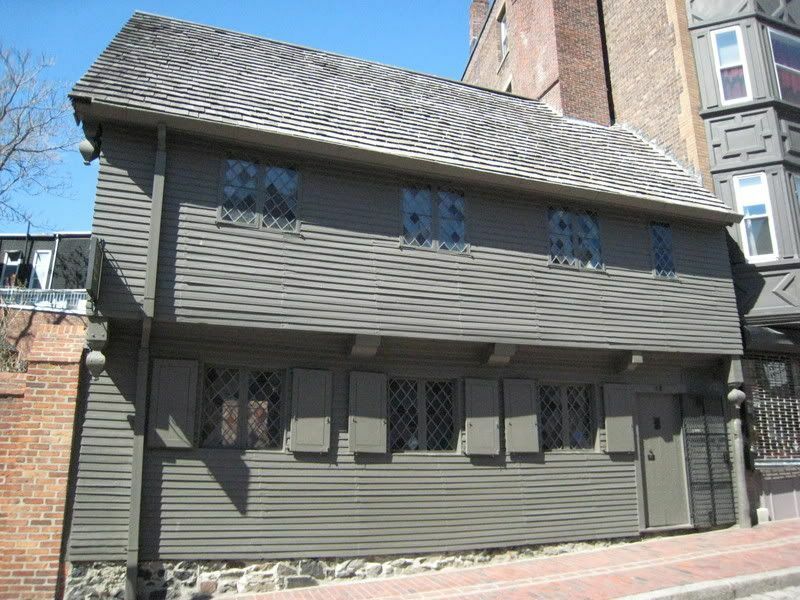 (2) and (3) The house of Paul Revere, the original "midnight rider" who rode to Lexington to warn that the regulars were leaving Boston and marching on Concord. In a future post I will have pics of the first house where he arrived with his news. This house dates from 1680. (4) The "Warren Tavern", dating from 1780. This was supposedly one of the first buildings in the rebuilt Charlestown, which had been torched during the battle of Bunker Hill. 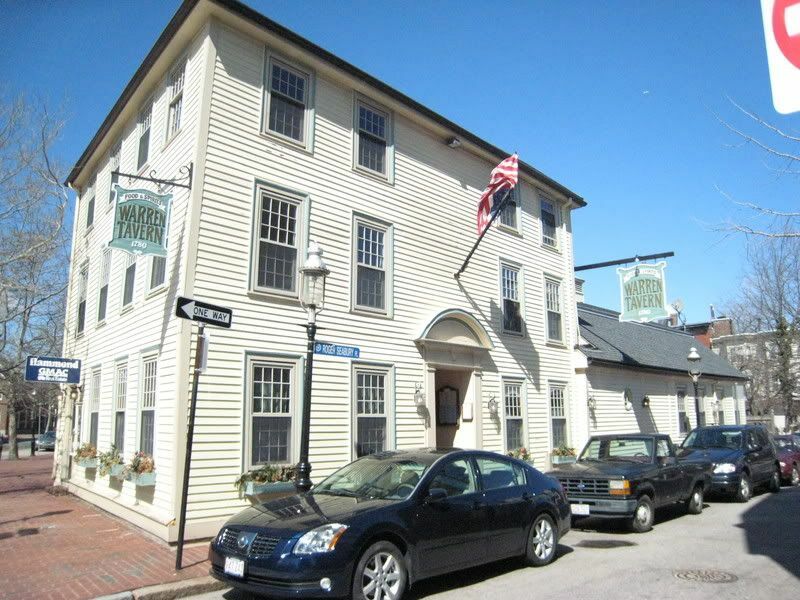 The tavern was named after General Warren, who died at Bunker Hill. 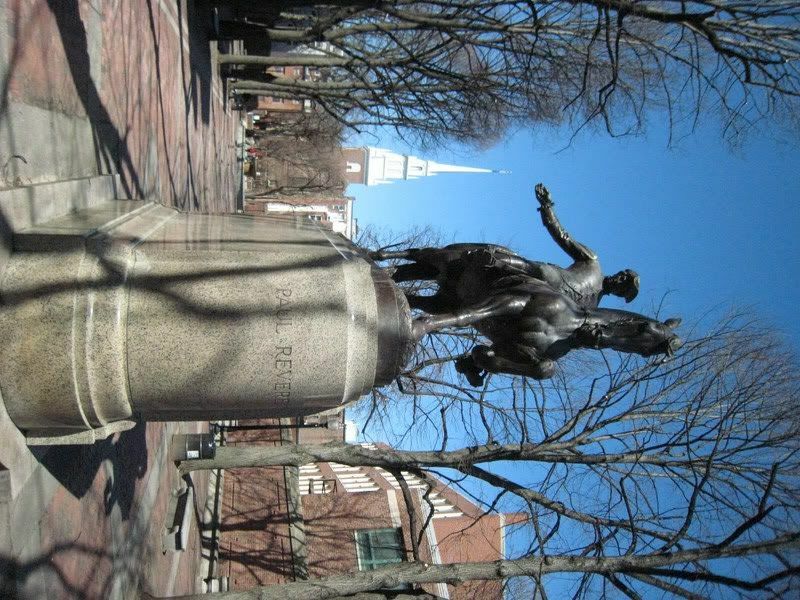 Below are (1) Paul Revere himself (1885), with Old North Church (1723) in the background and (2) the Bunker Hill monument, in front of which is a statue of General Prescott. Before I get stuck in to some photos of my recent AWI-themed holiday, I thought I'd post about some rather spectacular terrain pieces I recently acquired. I liked Barry Scarlett's vines so much that I asked him and his colleague Mark (both of Murray Bridge Trees and Terrain, here) if they'd be able to make some of those huge trees that appear in paintings and photos of American landscape. I was thinking particularly of Robert Griffing's paintings of the Ohio and Hudson valleys, which often feature enormous trees of varying kinds. 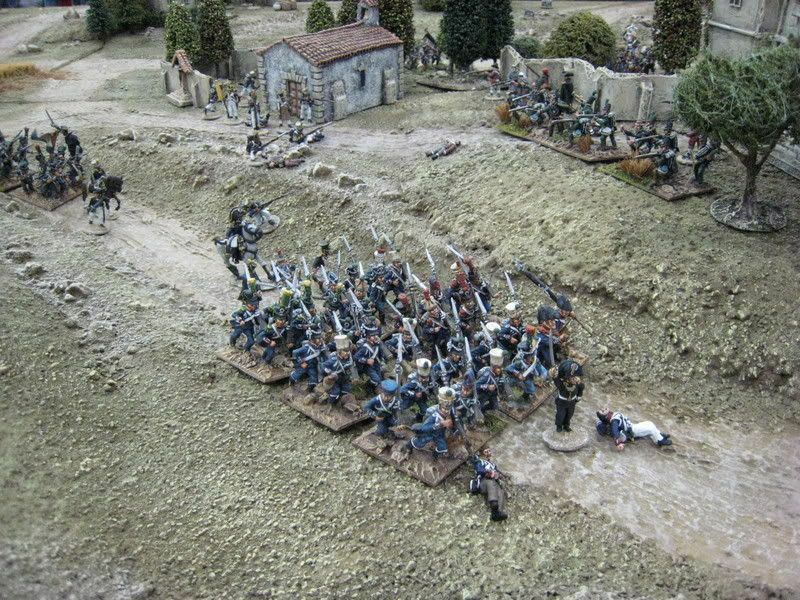 Pictures of the ACW's Wilderness campaign also spring to mind. In my last post I referred to giant redwoods, and I appreciate that those trees are only found on the Pacific coast. I suppose that's generally what I had in mind, absent any other specific genus. 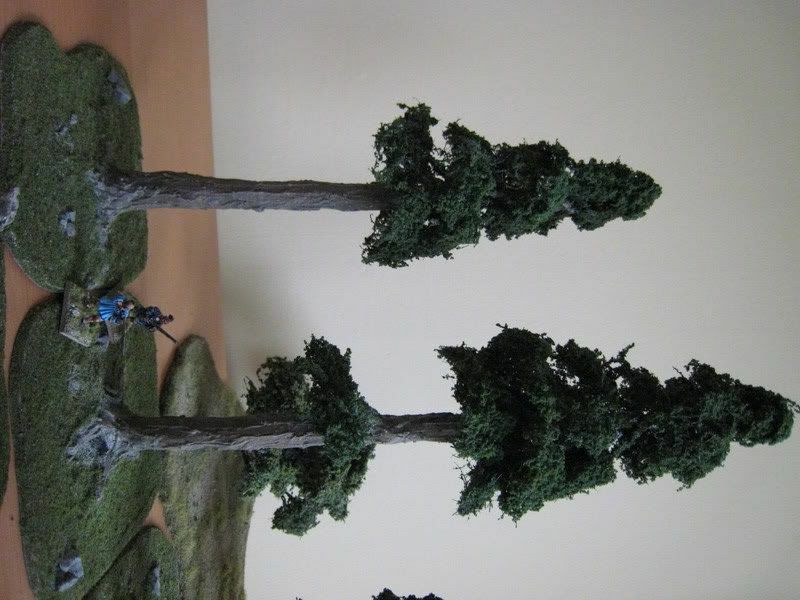 But to be honest, I'm not really that fussed about what species of tree these are; I just wanted something large to float at the back of my terrain and heighten the impression of a battlefield that was a long way away from old Europe. That said, answers on a comment post if you think you may have a convincing idea as to what these trees could feasibly be in upstate New York....There are no prizes - it's a serious question! The largest tree, on the right of the second photo, measures 36.5 cm high. Golly. 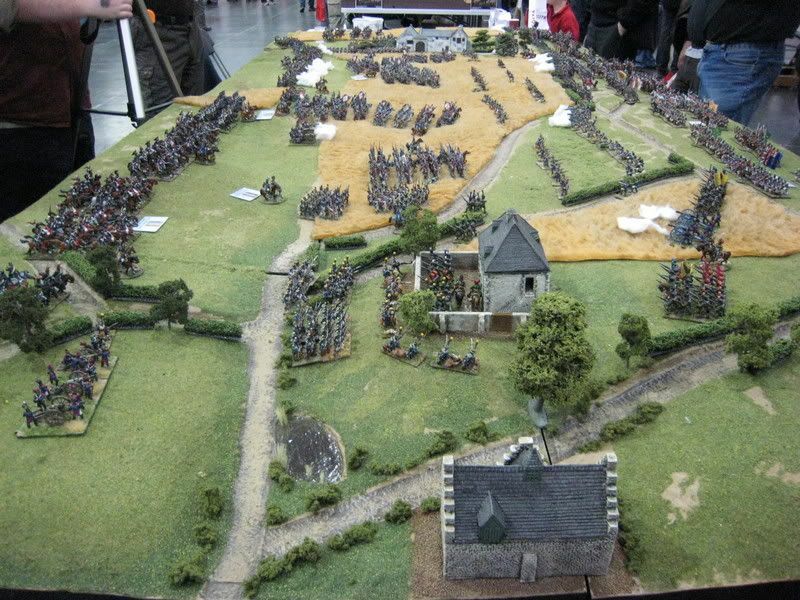 The figures are of course 25mm Perry sculpts, to give a sense of scale. 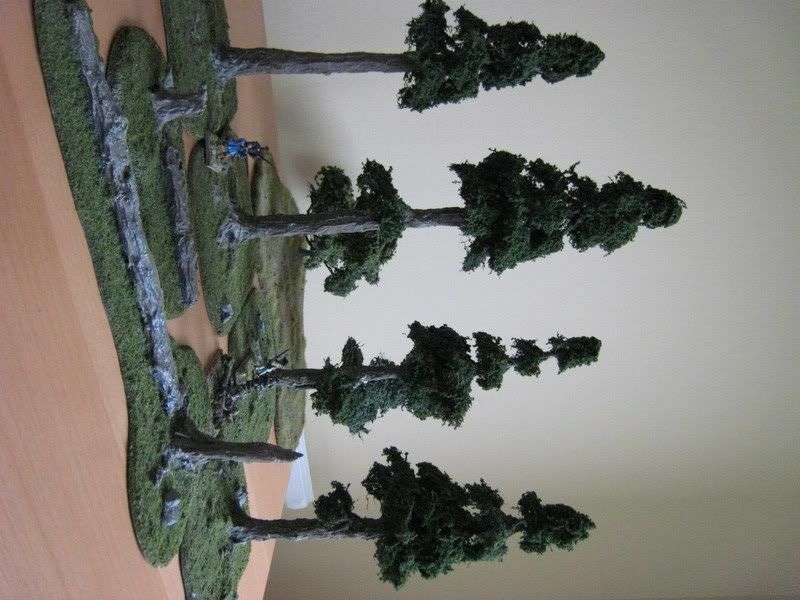 In the background is the wooded base I usually use for my photos - these are "small" trees from Realistic Modelling. Mark added a couple of bases of broken trunks; the shape of the larger one is, I think, a practical joke...I also bought some sachets of differently coloured "flower scatter" which I will add to the 84th Foot's bases when that unit is finally finished. 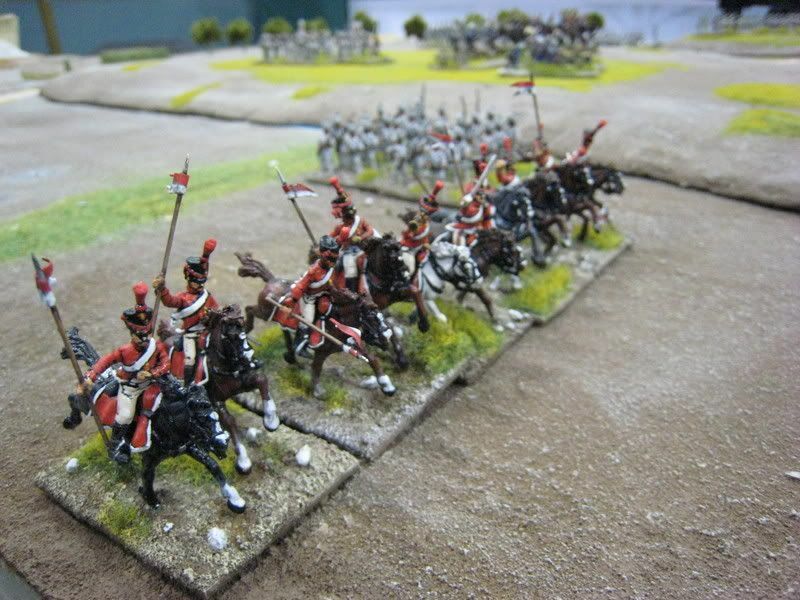 When I painted the 55th Foot a few years ago I liberally added to the bases the crystals from a Woodland Scenics lavender field mat - the result worked ok; I must take some photos of that regiment at some stage. ...and a fortunate wargamer indeed to have visited the sites of the first shots fired in both the AWI and the ACW. 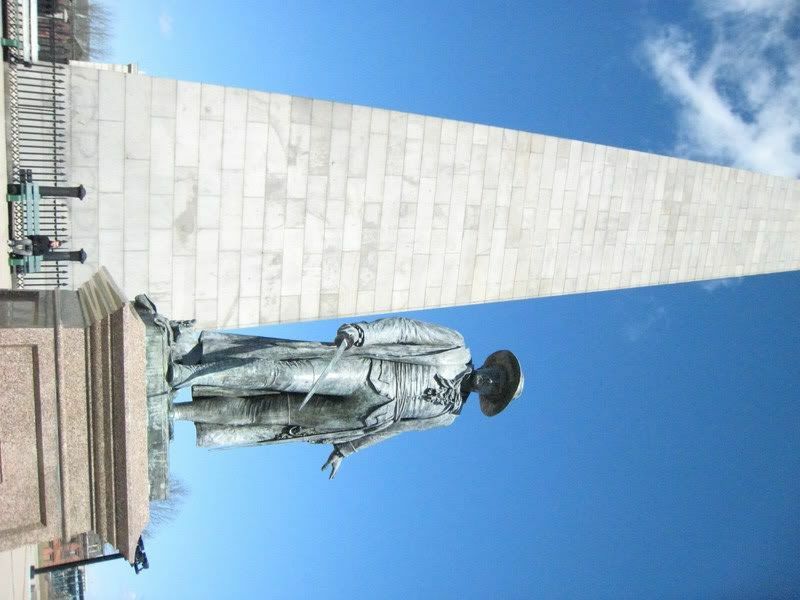 We spent the Easter weekend in Boston itself, with a trip out to Salem, and then stayed a couple of nights in Concord (in a tavern that dates back to the 1740s), which allowed for a day-trip down Battle Road to Lexington. We then headed off to Charleston in South Carolina (I will never forget the Kiwi's plaintive mumble at Boston airport that "it will be nice to get away from all this military stuff"...), where much fun was had in various museums, including the fascinating Confederate Army Museum which is curated by the rather rum-sounding "Daughters of the Confederacy". By this stage in the holiday I realised that telling the Kiwi all about the significance of Forts Moultrie, Sumpter and Wagner would probably result in the cancellation of certain wedding plans, and so we only admired the scenes of those actions from Charleston Harbour. 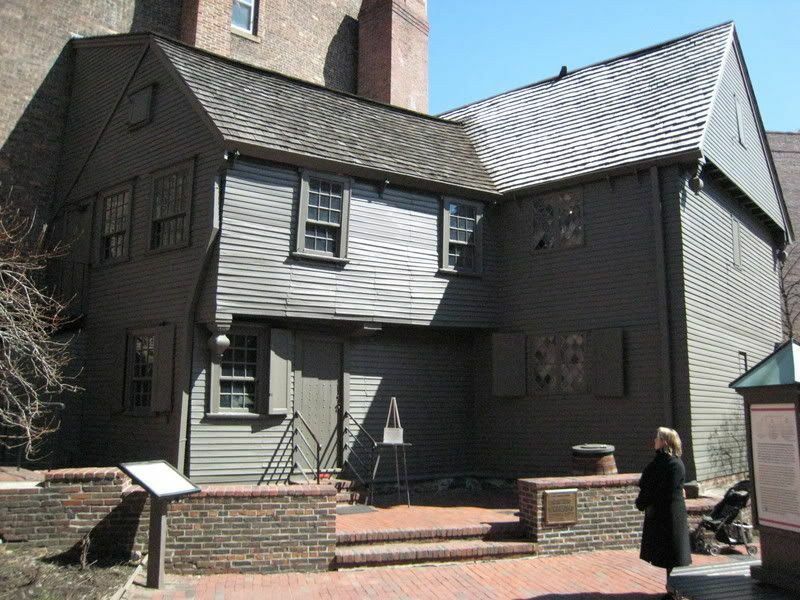 As always with holidays, the excitement of visiting much-anticipated places was counterbalanced by the disappointment of finding some closed (such as most of the witch-trial places in Salem and the American gallery of Boston's Museum of Fine Arts). But all-in-all it was an excellent holiday and any guilt I felt at innocently planning a route that just happened to pass some of the milestones of military history was more than assuaged by the amount of shopping that the Kiwi managed to fit in (including a certain handbag which has dramatically reduced the amount of cash I will have available for shopping at Salute...). In addition to seeing where the AWI began, my main concern on this trip was to photograph as many period buildings as possible so that I could build up a decent source of reference for scratch-built models. I'm not likely to want to create a miniature Boston or Charleston, although if I did I now know exactly what buildings I'd want and where I'd place them. More usefully though, Charleston, Concord, Lexington and Salem provided a rich seam of colonial architecture from which a host of models can be mined. Salem in particular has entire streets of houses that date from revolutionary and "Georgian" times, all helpfully marked with plaques that identify for whom the house was built and when. The basic architecture of residential New England doesn't seem to have changed much over the past 200 years, but after a while and some careful examination you begin to work out what's period and what's modern addition. Charleston architecture reflected the wider mix of people who lived there - "English" houses that are broadly similar to those in New England rub shoulders with more continental-looking, Huguenot buildings. Whilst the Kiwi was busy buying clothes and bags I was filling my suitcase with various books - a history of the F&IW by Fred Anderson (of "Crucible of War" fame); a privately-published biography of General Stark; histories of the two attacks on Charleston and Benedict Arnold's 1775 assault on Canada; David Wilson's new "The Southern Strategy", which deals with the South Carolina and Georgia campaigns of 1775-1780; Buchanan's chatty but very well-researched "The Road to Guilford Courthouse" (which I found second-hand in Harvard); "Taming Democracy" by Terry Boulton, which considers how popular conceptions of "freedom" and "liberty" were handled by the American politicians during and after the AWI; an account of Salem's colonial architecture; and finally a history of the Charleston Light Dragoons in the ACW, a militia unit that was drawn from the planter and merchant elite and which elected its new recruits, even after being taken on to the Confederate establishment. Lots of interest stuff in these, I'm sure. One final thought - the people we met in New England and Charleston were, without exception, some of the most polite and helpful people I've ever come across, passionate about their history and eager to welcome those who share an interest in their country. America up close and personal (and this was only my second visit, the first being to New York several years ago) is a far different place than some sections of the world's media would have us believe. I won't bore readers by posting all the photos I took (about 200), but over the next couple of weeks I will post items that might be of interest. These will be largely museum pieces; for for example, in Charleston Museum I saw 2 of apparently only 9 extant Continental Army 6-pounders, which answered the question I posed recently as to what the tops of the ammunition cases were made of (even the Kiwi felt my joy at this discovery; in fact half of Charleston probably heard it). 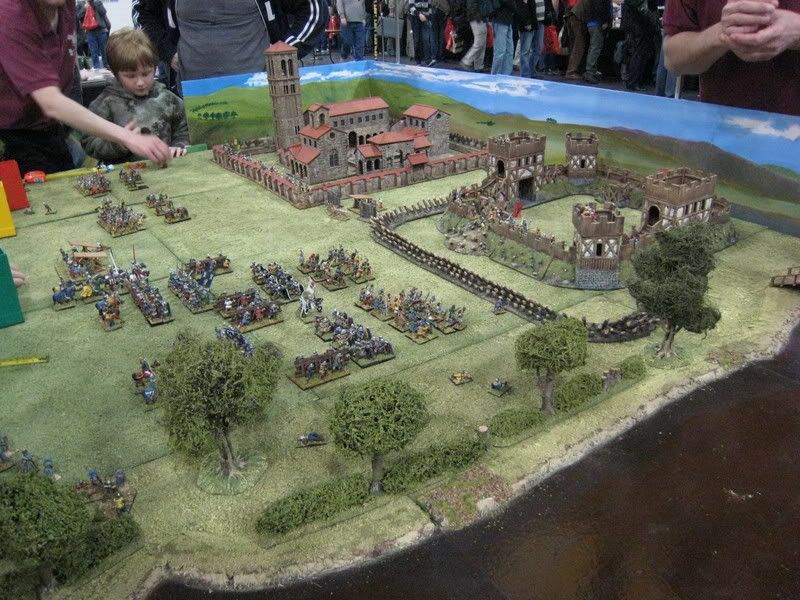 But I will also post pics of some of the period buildings, because they were beautiful and other AWI gamers may find such references useful. 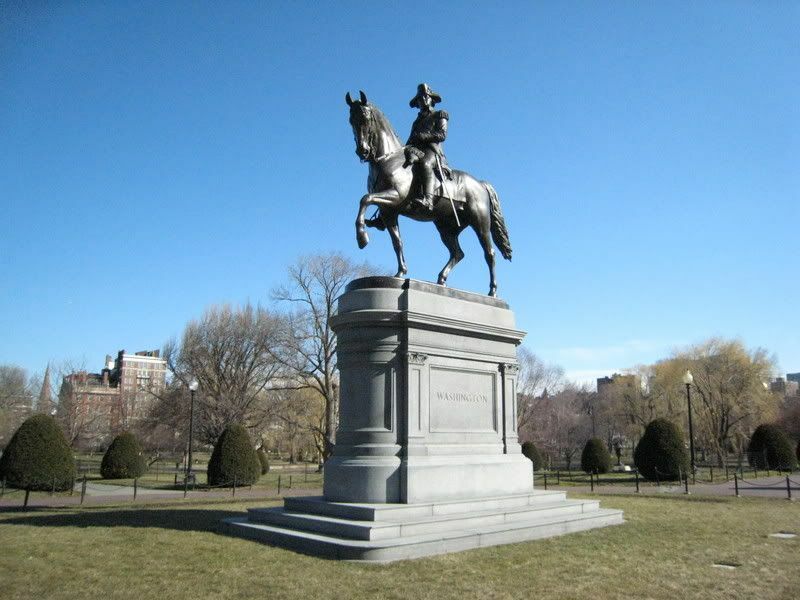 The two photos above show the two statues of George Washington that I came across, the first on Boston's Common and the second in Charleston. I believe that the former is the first statue of Washington that was erected (or the first on a horse, or the first in public, or something like that...) You can see the difference in climate between the two cities! As for painting, March was pretty much a write-off. The 62nd are based, but have no flags. The 84th are half-finished, but need another week at least. My Confederate infantry regiment (as yet unidentified) is coming along nicely, but I need to buy the figures to finish it off at Salute. However, today I received from Barry and his chums in Australia four giant redwood trees that I asked them to make - photos of those will be up in a couple of days. They are huge.